Anyone who has published one book knows how hard it is to build an audience. Everyone starts here. For those that persevere, a second book is a way to leverage all that hard work of audience building. It gives your fans something else to buy from you. At the same time, launching a second book always attracts new readers. Some may buy that new book. Some may decide to start with book 1. Either way, one of the best investments you can make is to ensure the two books cross-market each other. As any experienced salesperson will tell you, it is easier and far less expensive to sell something new to an existing customer, than to try to find new customers. Just ask James Paterson and Malcolm Gladwell. Our client Giridhari (Giri) Das, a Brazilian yoga guru, recently approached us for help with his second book, Yoga Sutra Revolution. We helped Giri with his first book, The 3T Path, in 2017 and Yoga Sutra Revolution is his follow-up title. In Giri's case, his goal was to make minor changes to the first book. Writing a second edition would be essentially starting over. Our challenge was to keep his investment minimal. Here is a checklist of what we changed that would not trigger the assignment of a new ISBN. As you may know, a new ISBN means your book's reviews stay with the ISBN being replaced. Addition of new content. Explained further below. We updated his Kindle eBook so it will link to his book review page on Amazon. We added the book cover for book 2 to the back of book 1. We also added some explanatory text about book 2. For book 2, Yoga Sutras Revolution, we added The 3T Path cover and explanatory text to the back. There are a few work-arounds and rare exceptions to the above so contact us if you have questions. There are also a few other changes you can make to book 1 without triggering the need for a new ISBN. “After publishing The 3T Path, I began lecturing on the book as a whole, as opposed to individual aspects of it. One day I was teaching to a small group using a white board and came up with an interesting graphic version of how the separate parts of the book came together. I liked it so much I knew I had to share it, as it really brought out important and practical insights. When I finish presentations, people often want to take a picture of it. Now I can say, “don’t worry, it’s in the book!” And since I felt it necessary to add this new appendix, I gave myself some liberty to do one more change. The book recommends so many new habits, but I had failed to give suggestions on how to acquire new habits in life. In blogs and videos done after publishing the book, I presented what I consider the most effective techniques for bringing about these new habits. Do content changes require a new ISBN? Did you discovered a typo or three in your first book? Or maybe like Giri you want to add content. My “guideline” is to consider the reader and the book format. Since print books can be resold as used books, would a shopper be disappointed to get one version of the book vs. this new one? A new ISBN enables them to distinguish between the new and old versions. Chances are that you programmed your first eBook before it had an Amazon-assigned ASIN. But now that it does, you can go back into the file and add a direct link to the Amazon review page for that book. That was the case for Giri’s The 3T Path. In the link below, replace the “B06XG7L51Z” with your book’s ASIN found in the Product Details section of your Amazon page. Tip: Only do this for your Mobi file, or the file uploaded to Amazon. Apple for one is notorious for refusing eBooks with links to Amazon. I close with Giri’s plans for his second book. Specifically, how does having a second book change your marketing this time around? “I had a traumatic experience with marketing my first book and blew away my money with zero result. Now, I’m probably swinging the pendulum to the other side, but I intend to keep my marketing simple and stupid. No budget. No professionals. Just sharing the news about the new book on my website and social media, then from then on reminding my public about the book at every chance. Self-publishing is evolving into something more than a way to publish that manuscript that got rejected 22 times before you gave up. It’s now a strategic decision that can benefit from careful planning and execution. Cranking out books to build a backlist is one approach. But savvy authors find success by reinvesting in already published books; finding ways to make them work harder. Not just to sell books, but to also support their non-book business opportunities. 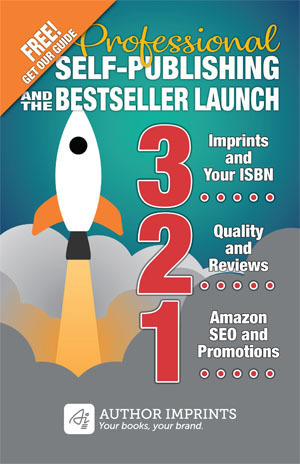 AuthorImprints helps self-publishers think about their book investment strategically. Contact us about your next book.